If it seems to you that everyone and their cousin wants to get into the hypercar game, you're right. We see new supercar startups popping up all the time. Some make it to production and some don't, and while it may be too soon to render verdict on this latest project, we hope it's one that comes to fruition. 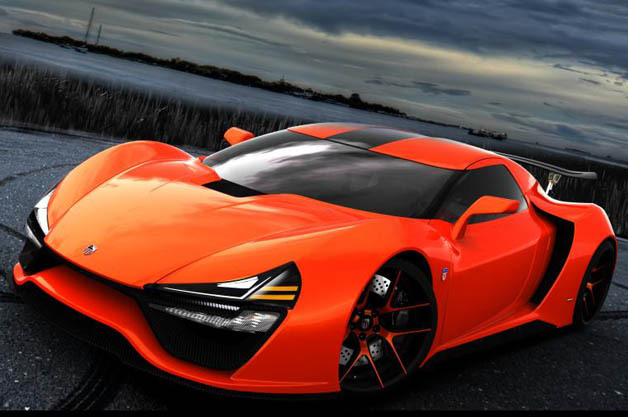 The company is called Trion Supercars, and its bid for high-speed glory is called the Nemesis. We first reported on the project back in the spring, but a few more details – and a handful of additional images – have surfaced, whetting our appetites and giving us a clearer idea of what to expect. Targeted squarely at the likes of the Bugatti Veyron and Koenigsegg Agera, the brief for the Trion Nemesis calls for a 9.0-liter, twin-turbo V8 driving around 2,000 horsepower through an eight-speed sequential transmission to all four wheels. If Trion does its considerable homework, that should be enough to propel it to its anticipated top speed of 270 miles per hour, reaching 62 in 2.8 seconds. Trion Supercars aims to have the first prototypes – being built by California-based coachbuilder N2A Motors – ready by February, after which it plans to build 50 units at over $1 million apiece starting in at the beginning of 2016. We wouldn't be surprised to see that cost inflate by the time it reaches the road, though, joining similar world-beating hypercar projects like the Hennessey Venom F5 and SSC Tuatara in the high-speed pipeline.